Decluttering the closet we use every day is something most of us mean to do but never actually get around to doing. Yet the holiday season – and especially the month of December – offers the perfect time to roll up our sleeves and get stuck into some serious editing. Decluttering your closet during the holidays is also a great idea because you may have just acquired some new clothes for the fall/winter season or received items of clothing as gifts from family and friends. This means some older garments you own may have just become redundant or started to look rather tired next to your new clothes. So come on, let’s not put this off any longer. Follow HKT’s guide to decluttering your closet and start saving yourself time, money and stress by having a thinned out closet that works perfectly for you. First of all, take all your clothes out of your closet. It’s really important you do this, because it will help you get reacquainted with all your garments and allow you to check out their quality. Also, physically touching shirts, suits, pants, casual wear etc, is far more likely to force you to make a decision about them than just viewing them on their hangers. Now you’ve got all your clothes in front of you, you need to separate them into three piles. The first pile is for clothes you wear regularly (or at least within the past six months). The second pile is for items you haven’t worn in the past six months. And the third pile is for items that need repairing or tailoring to make them wearable again. Now you’ve got your three piles of clothes in front of you, it’s time to get ruthless and decide what’s staying and what’s going. Because pile 1 features items you regularly wear, all of these garments should successfully avoid the cut this time around. Although it might be worth noting down any items that are currently falling out of favor, as this will help you make decisive decisions about them the next time you declutter (more of that later). For pile 2, think about why you haven’t worn a piece of clothing over the past six months. If it’s a seasonal item or something for a special occasion, eg a winter coat or a tuxedo, then it’s understandable why you might want to keep them. But if it’s just a regular item that’s gathering dust, it’s time to say goodbye. That might be a difficult decision with some items that you’re emotionally attached to, but we promise that you won’t look back once you’ve got rid of something. Being ruthless at this stage is really important, otherwise the same old pieces of clothing will keep creeping back into your closet forevermore. Right, to pile 3 now. These are items that either need repairing or tailoring to bring them up to scratch. The big thing to think about here is whether the cost of a repair or tailoring will be worth it in the long run. Would you be better served buying a new item than trying to bring new life into something that’s pretty tired now? As a rule, we’d say if you’re not willing to take these items to be repaired or tailored in the next few days, it’s time to get rid of them. With that thought in mind, find two bags and place in each what is going to your tailor this week and what is heading out of your life forever. Come on, be brave. You can do it! Okay, so the bulk of your declutter is already done. Now you just need to do a bit of fine tuning with a second edit. This is all about looking for duplication in the items you’ve saved. For example, you might have three white work shirts that are of a differing quality. Yes, you might still wear your oldest shirt every other week, but do you actually need it, especially if you’ve already got two superior white shirts? During this process you’re probably not going to lose too much, but it’s still definitely worth doing. Getting your closet as lean as possible is your ultimate aim, and keeping things minimal will also help with the next step, as it will make it clearer what basic items you need to add to your closet. With your edit done, you can now take stock of your complete wardrobe. This is a fantastic position to be in, as it will help you identify any garments that you might be missing. 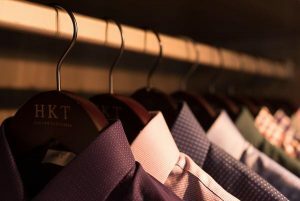 A good way to identify missing essentials is to group all your shirts, pants, jeans, suits, etc, into separate batches. Typically, what you should see is that you have a personal fashion style for each type of garment, eg you prefer shirts that are tailored in a certain way, or you like slim fitting jeans which sit high on your waist. Now what you need to look at is whether you’re missing any essential colors or tones from your separate batches. For example, you have lots of custom made white, cream and checked shirts that look similar but nothing in a bolder, brighter color which would work really well with your suits. This should focus your shopping in the future, as you’ll know what style you regularly wear and what colour/tone would be a great addition to your wardrobe. It will also help to stop you making impulse buys that you really don’t need. – Gift any items that are still of a good quality to family members or friends. Remember your unloved sweater may be the perfect golf jumper for Uncle Dave. – List unwanted items on eBay and earn yourself some dollars. This extra cash can then be used to buy some new essentials for your leaner, meaner wardrobe. – Donate your clothing to local charity stores in your area. For example, in Atlanta there’s the The Salvation Army, Goodwill, or Thrift stores. – Schedule for a charity such as to pick up everything you want to get rid of. Perfect if you’ll struggle to get to a thrift store. After you’ve finished your decluttering, something we recommend you do before putting all your garments back is to take a good long look at your empty closet. Think about how you could reorganize it to make your wardrobe more accessible and what would allow you to view more of your items when you’re getting ready in a morning. For inspiration on how to do this, we recommend you head to Pinterest and pop in search terms such as ‘men’s closet ideas’, or something more specific like ‘men’s closet ideas small’ or ‘men’s closet ideas walk in’. Hopefully, you should see at least a couple of good ideas that you can easily implement to improve how you interact with your closet. Another good idea going forward is to group garment types together and hang them from dark to light. This can really help to quicken up the process of matching garments which complement each other. At this point, we’d just like to say that decluttering your closet is not just for Holiday time, it’s for life. Staying on top of your wardrobe is something you should continue to do from now on. So try to establish two or three times in the year when you can follow this whole process. As well as Christmas/New Year, the change of the seasons (spring and the fall) present a good time to do this, as it’s when new items hit the shops and when seasonal wear becomes important. So there it is, our answer to the question: How do I declutter my closet? We hope you find our guide super useful. And if you do struggle to identify new essentials for your closet after your edit, please don’t hesitate to get in touch with the HKT team. We’d be more than happy to discuss what new garments could lift your wardrobe to the next level. In fact, you could even bring in a photo of your thinned out wardrobe so we can get a really good idea of which basics would complement the garments you already have.